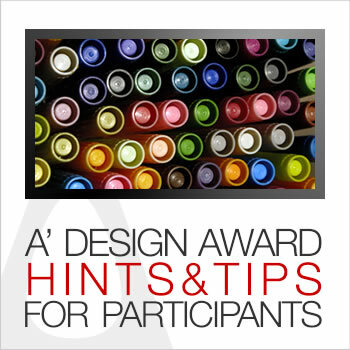 To help you in making your nomination to the A’ Design Award and Competition, we have pulled together some Hints & Tips, which we hope will answer some questions you may have. During registration, please read first the article about "Choosing a Name" (for registration purposes). Important aspects to remember: PR Agencies should register different accounts for each of their clients. Each account should belong to those who designed the project, preferably to the design teams or designers themselves. Companies shall create accounts for their names or for their in-house design teams. It is possible to credit photographers and team-members during entry, and there is no need to create accounts for them. It could be possible that your entry could fit to a couple of categories. If so, our advice is to select a single category which fits your entry. During the judging process, if the judges feel that your entry would be better suited in another category, the jury will move your application to the relevant category. The category change is done only if your entry is more likely to get a better score in the new category. Important: You cannot nominate the same entry to different categories, however if you wish to nominate the same product, design or service to multiple categories, you are required to create multiple presentations, tailored for each different category. You are not allowed to use the same main image and optional image #1 for multiple entries. Don't rush the job. It could potentially take more than a week to prepare your presentation (Especially if you do not follow the presentation guidelines initially, you will be receiving update requests from the preliminary jury for each error in your presentation). Most applications in the awards process lose valuable marks because they do not take the time to gracefully explain their ideas, designs, innovations, products or services. Entrants should remember that their first objective is to prepare a perfect presentation of their entries. The presentation includes two aspects: Graphics and Text. Do not join the awards the last day unless you are a highly professional team that has already prepared the deliverables in advance. Start your application by downloading the award presentation guidelines. Please do kindly make sure that your application is easy to read. When typing your entry text avoid using industry jargon and superlatives. Avoid use of any acronyms without first explaining what they stand for. When typing text details, please read the hints and highlights or any examples first. You do not need to attempt to keep the reader interested throughout the whole of the reading, but two sections could be written with detail: Inspiration and Unique Properties. For the Yearbook section, you must talk about the nominated entry from a third perspective using simple English. The use of "Simplified English" is especially required to ensure that we could translate your text to multiple languages without any translation errors. It is especially important that you keep your application form concise and to the point, do not type excessive text, try to keep in the suggestions and limitations proposed by the Advanced Submission Optimizer. It is suggested that you get help from a linguistics expert (such as a writer, editor, translator) to ensure that you communicate your idea completely if your native language is not English. When typing text or making your entry, make sure that what you say in the application is correct, including any claims about patents or trademarks. Use your prior experience, provide external data and research results to back up what you say by uploading a PDF document. Any and all technical details can go to PDF. The PDF will only be visible by the jury members, and will be deleted after awards announcement. Furthermore, you can support your entry with a video presentation, upload a video only and only if it is really good. Instead of uploading a video, you can also provide a link to the video. Not by calling or email them (or our support), which will result in your disqualification. Instead go through the following best practices: 1. Make a perfect visual presentation. 2. Clearly explain what makes your entry better than the rest of the competition or clearly explain how your idea is unique, functional or interesting. 3. Follow all emails that relate to Preliminary Checks and update your presentation as many times as required (you can edit your entries; no need to create new entries), till your entry is "Totally Approved". Good visual and textual communication is very important.